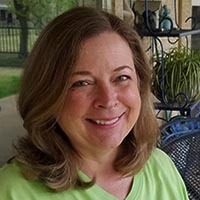 The temperatures have been up and down a lot this winter, and I feel like we’ve had more cold weather than normal for north Texas. When the temperatures dip, I like to make a pot of homemade soup to warm me up. 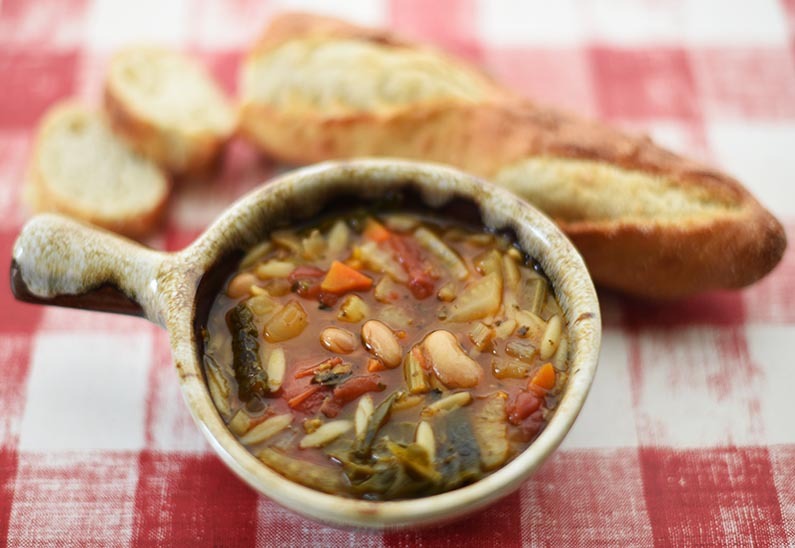 One of my favorites is this Italian Bean and Pasta Soup. This pot of soup makes plenty for a few people, or in my case, I have leftovers for a few days. I vary the ingredients in the soup depending on what I have in the kitchen. Ordinarily, I have fresh herbs growing in pots on the patio year round, but they didn’t make it through the cold snap we had while I was away on vacation. So I used dried herbs in my soup instead. Dried herbs are the crushed dried leaves and not the ground version of the herbs. When I use fresh herbs, I add a little more as they’re not as potent as their dried versions. An Italian spice mix can be used instead of individual spices if that’s all you have in your spice cabinet. I like the Italian style stewed tomatoes from Costco as the Roma tomatoes are seasoned with Italian spices. However, I have to cut the tomatoes into smaller pieces for the soup. Use regular diced tomatoes or those with Italian seasonings, and you won’t need to cut up the tomatoes. 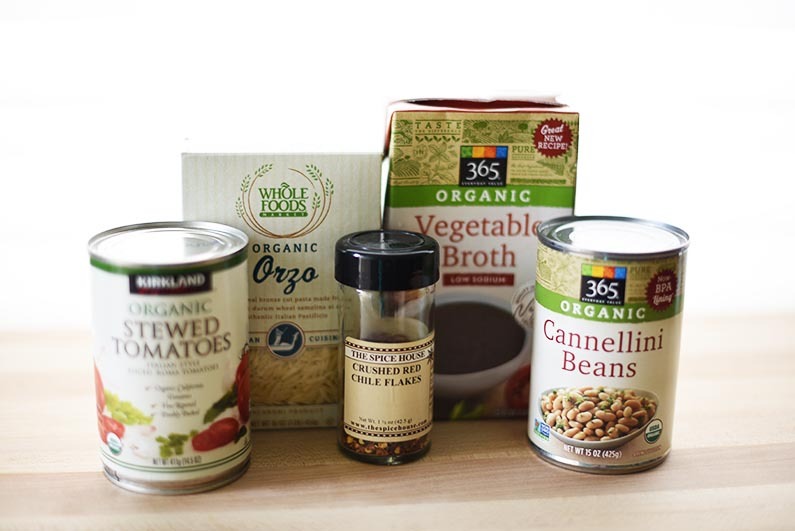 If you don’t have cannellini beans, substitute great northern beans, navy beans, or any other white bean. Dried beans are an alternative to canned beans. Just be sure to allow for the time it takes to soak and cook them prior to adding them to the soup. There are many pasta options, too. The pasta should be small such as orzo (used in this soup), ditalini, cavatelli, acini di pepe, or pastina. 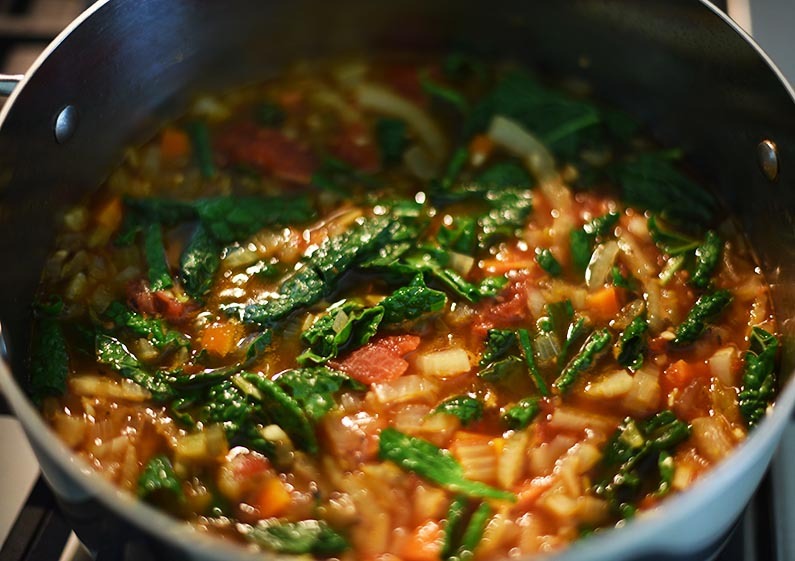 For this particular pot, I had fennel and kale in the fridge, so I added them to the soup. 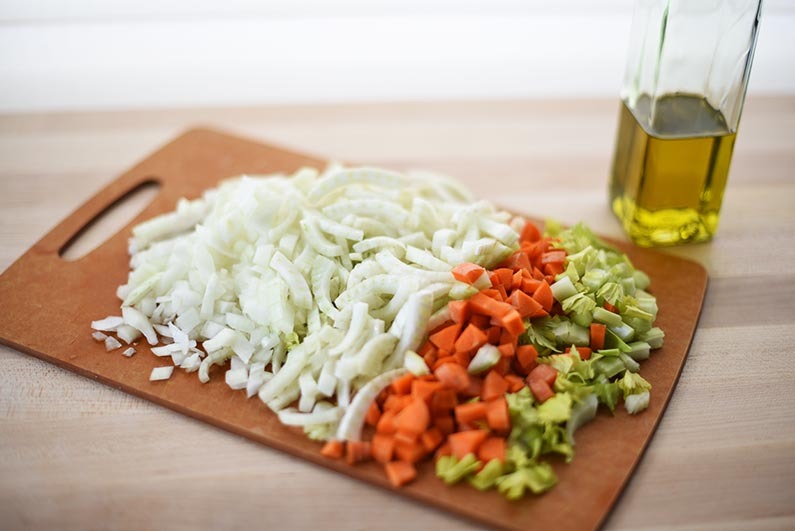 Chop the carrots, celery, and onion. Quarter, core, and thinly slice the fennel bulb. If you prefer, you can chop it like the other veggies. However, slicing the fennel adds interest and sets it apart from the chopped onion and celery. Fennel is a nutrient rich vegetable high in Vitamin C, fiber, potassium, and folate. 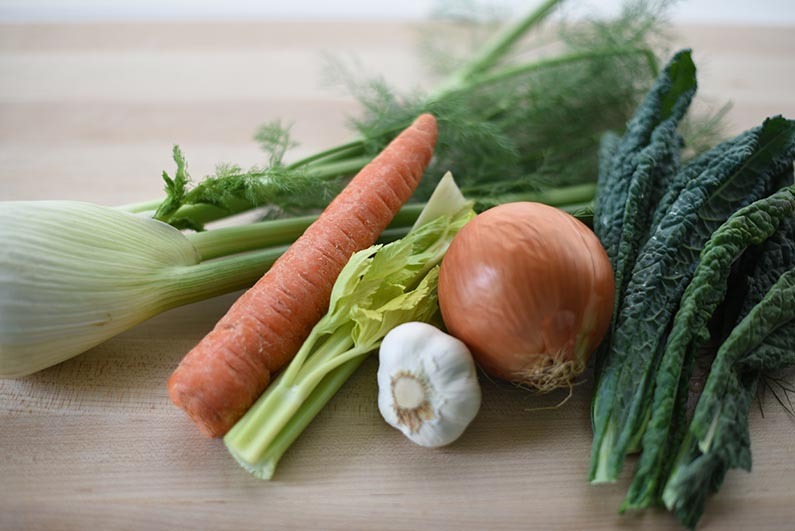 If you don’t have fennel on hand or don’t like the mild sweet taste similar to anise, leave it out of your soup. 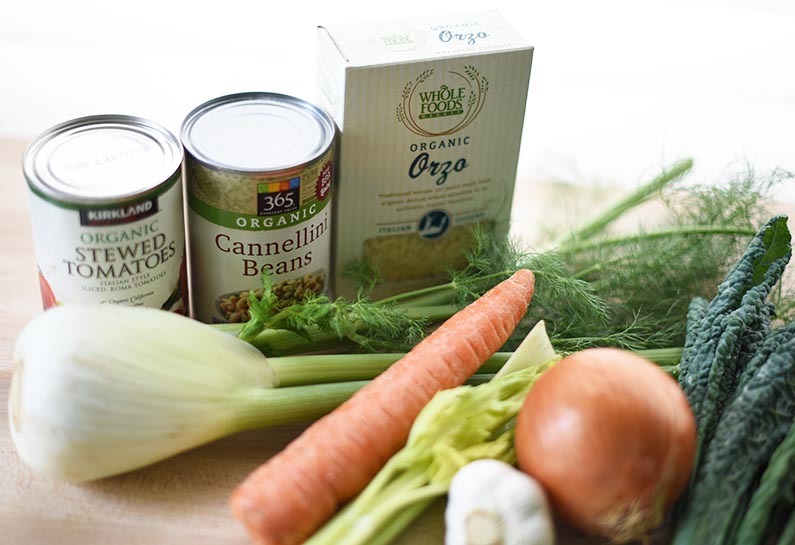 I often don’t have fennel around, and the soup tastes quite good without it. Strip the kale off of its spine and cut it into 1 inch pieces. I used small leaves of kale, so I chopped up about a dozen leaves. If you’re using larger leaves, you only need 4 or 5. 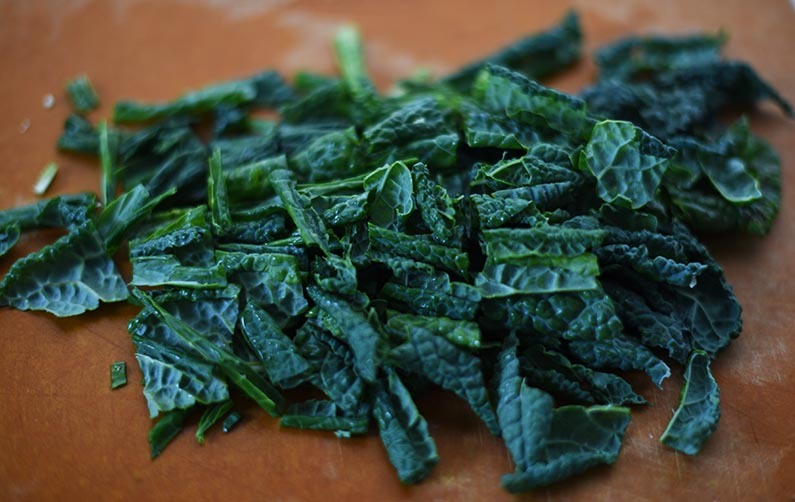 Kale is high in Vitamins K, A, and C, as well as lutein which supports eye health. When I don’t have kale in the fridge, I substitute spinach either fresh or frozen. Kale usually comes in a bunch larger than I need for the soup, so I prep the extra for future pots of soup and freeze it in a freezer bag. Then all I have to do is grab a handful and throw it into soups or smoothies. Add everything but the beans and pasta to the soup and simmer it for a few minutes. Your kitchen will be filled with the aromas of herbs and garlic. Lastly, add the beans and pasta and continue to simmer till the pasta is tender. 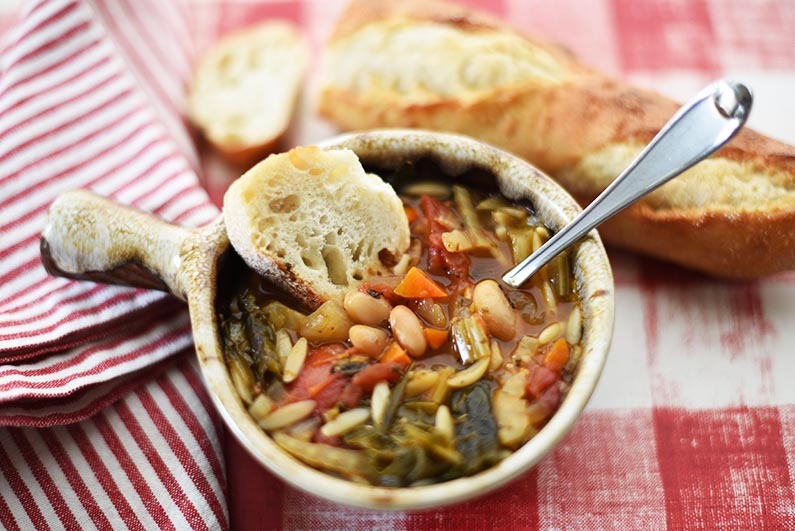 Your nutrient rich Italian Bean and Pasta Soup is now ready to serve. Cut off a few slices of a sourdough baguette to accompany the soup and savor a hearty meal that will warm you from the inside out. Enjoy! In a medium stockpot, heat the oil over medium high heat. Add the onion, carrot, celery, and fennel. Cook till softened. About 10 minutes. Stir frequently. Add the red pepper and garlic. Cook 4 minutes. Stir frequently. Add kale, oregano, thyme, and salt and pepper. Lower heat and simmer 10 minutes. Stir occasionally. Add beans and pasta. Cover and simmer about 20 minutes or until pasta is tender. Stir occasionally.